The North Carolina EastEnders fan club consists of hundreds of avid EastEnders fans from across the state. We get together several times a year to share our enthusiasm for Albert Square. Attention Walford Gazette readers: here are the videos mentioned in our article. Now is the time to make your 2018 EastEnders pledge! We are pleased to announce the official start of our 2018 EastEnders fundraising campaign. Now is the time for you to make your annual pledge in support of our program on UNC-TV. The goal for our group this year is $30,000, which is $10,000 less than previous years that involved on-air marathons, since online pledging is more economical for the station and pleases the general audience that wants fewer regular program interruptions. The EastEnders memorabilia auction and pop-up store at the Watch Party in April generated $1,956, so our goal now is just a few dollars over $28,000. That should be no problem for this club of enthusiastic fans! We will be sending a separate note of thanks to all of the auction participants-our generous contributors and bidders who got 2018 off to a great start for EE in NC. So, how to make your donation: UNC-TV has set up a special online EE store for our group. Note that it is *not* necessary to pledge for a gift. Through the same storefront, you can simply make a contribution in any amount without requesting a thank-you gift. The idea is to use the storefront so that UNC-TV can track all contributions in support of EastEnders and add them to our group total. You can make a one-time donation or spread your contribution over a 12-month period ("monthly sustaining"). You will find detailed descriptions of each thank-you gift when you click on the image. 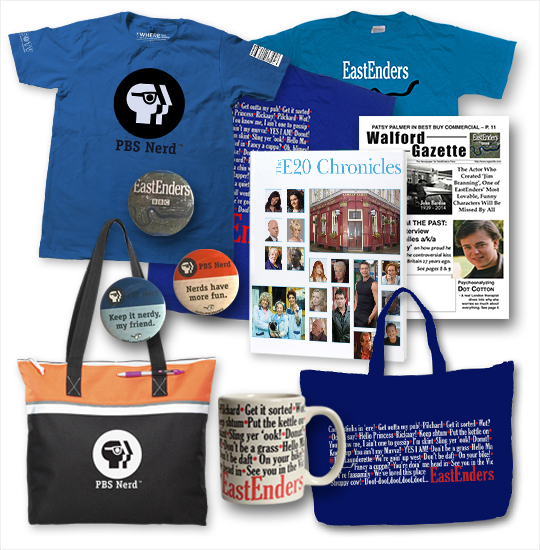 And, a special surprise: by popular request, we've included a few of April's auction items at a discount, including the charming Dogs of Walford fine prints and the production EastEnders scripts! We know that some of you have already pledged in support of EastEnders in 2018. If you have not yet notified Dave or Linda about your contribution, please just reply to this message and tell us. No need to mention the amount of the pledge; we just need your name, so that we can make sure your gift is credited to the group total. Thanks so much! That's it, gang. Let's get those pledges rolling! 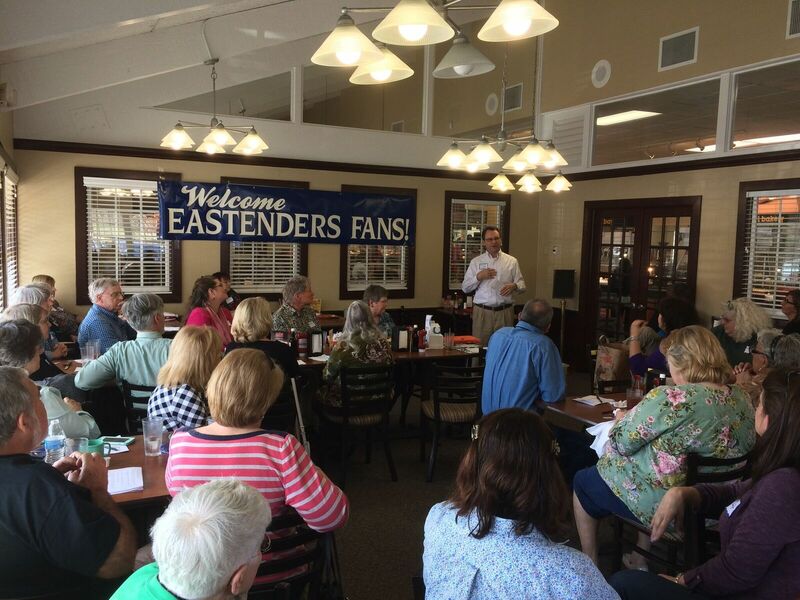 The EastEnders Watch Party on April 14th was a huge success! Check out the photo album. Many thanks to UNC-TV for hosting us and making the event so memorable! EastEnders Watch Party on April 14, 2018, and fundraising news! Indulge in delectable British snacks and beverages, including "The Queen's Cocktail"
Those who cannot attend the Watch Party will still be able to bid on EE collectibles, as we'll be holding an online auction in conjunction with the Watch Party. We'll provide details on the auction closer to the April 14 event. Please note that, just like last year, there will NOT be an on-air fundraising night for EastEnders. UNC-TV is committed to reducing on-air pledging, in response to viewer feedback. The new fundraising initiatives, mostly online-based, are much more cost-effective and less labor-intensive. They avoid regular program interruptions and keep viewers happy. Due to the lower costs and overhead, we're delighted to announce that our 2018 EastEnders fundraising goal is $30,000. That's $10,000 less than we needed to raise in previous years, when we did on-air pledge drives! We'll be launching a variety of initiatives to reach our $30K goal, including a year-round online store with EE pledge gifts. Stay tuned for details in the coming weeks. We're looking forward to seeing old friends and new members, and UNC-TV is excited about welcoming our group back to the studio! See you very soon. EastEnders Match Day and luncheon recap! On Saturday, 2/25, over 50 EastEnders fans, plus five staff members from UNC-TV, gathered together for lunch, fun, and a great talk by Brian Sickora. More on that later, but first a report on how our big Match Day event went. Not only did we meet the $7,000 challenge from Dr. de Luca and Linda Fineman, we surpassed it for a grand total of $7,225!! Outstanding work and an incredible team effort! That gives us $14,225 for Match Day alone and close to $22,000 for EastEnders Week. The latter figure keeps growing, as we learn of EE contributions that came in without going through the nerd platform. We'll be able to report a more exact figure later. Yesterday's 20th anniversary lunch was a delightful gathering, and it was great to see so many familiar faces and also welcome several newcomers. Get a group of EastEnders fans together, and it's instant camaraderie—no need for icebreakers in this club! We could have spent all afternoon chatting and still not exhausted our mutual themes of interest. We had great representation from UNC-TV: our beloved Julia Carpenter, who is an Independent Producer at the station, Sue Scott, Senior Director of Marketing, JC Polk, On-Air Fundraising Producer, Jen Newmeyer, Digital Fundraising Manager, and, of course, our star attraction: Brian Sickora, the new Executive Director and General Manager of UNC-TV. Brian's talk was truly inspiring. He has a vision for UNC-TV that will carry us into the future and improve the overall "brand" of UNC-TV and PBS. For many years, PBS membership has been on a steady decline, and Brian has a proven record of reversing that trend at the stations where he has worked. Given his impressive career trajectory, you can rest assured that we are in very capable hands. On a personal level, Brian is completely down-to-earth, friendly, and approachable. He told us that he had a great time yesterday, and several fans stayed late to talk with him. Sheila Valentine graciously stood in as Quiz Mistress for Linda (who had a lingering cough). The quiz is called "How Closely Have You Been Watching," and Linda based it on the last three weeks of EE episodes, so you should all give it a try! We'll send the solution with our next e-mail update. 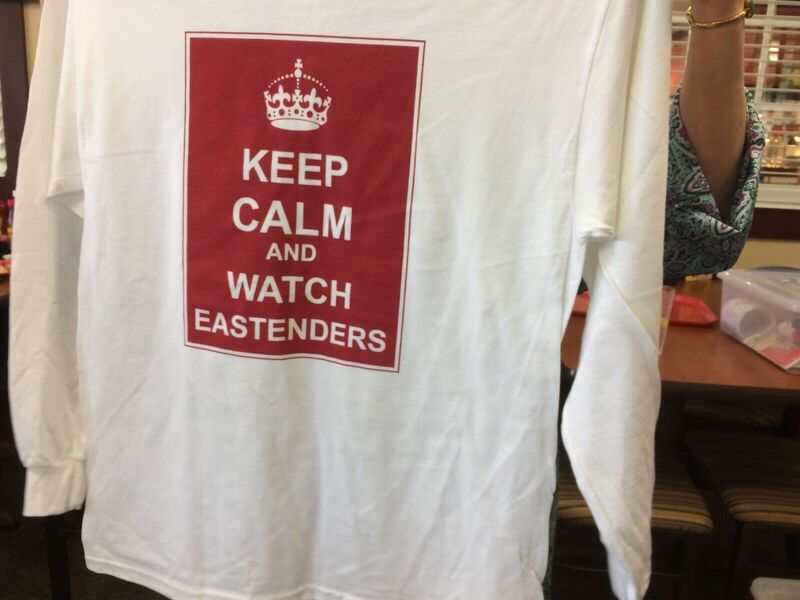 Seventeen very happy quiz and raffle winners went home with these lovely Keep Calm tee-shirts, courtesy of our good friend Debbie Gilbert, editor of the free E20 Chronicles EastEnders e-newsletter (contact her at E20Launderette@gmail.com to subscribe). Thanks, Debbie, for supporting all our events, even when you can't attend in person! We were also thrilled that Dr. Emilie de Luca came and even brought a box of EE memorabilia, which she donated to the club for future fundraising efforts. Thank you Dr. de Luca, for everything you do for EE, UNC-TV, and our group! And thank you most of all to the fans who helped make Match Day and our earlier Gift & Collectible Day a huge success. You answered our call to action, and we appreciate it more than words can express. What an incredible group! We look forward to seeing everyone at the Watch Party that UNC-TV is organizing for us in June. More details to come! Announcing the N.C. EastEnders Facebook Group!